We are now entering the fourth Industrial revolution! The rise of Intelligent Automation, including Robotic Process Automation, is a big part of this new wave, and will have a profound impact on the way work gets done. A hybrid workforce, made up of a mix of humans and bots, is inevitable. People and businesses will need to embrace the new economy and learn new skills to both take advantage of this opportunity and to stay competitive. Intelligent Automation (IA) is an emerging set of new technologies that combines fundamental process redesign with advanced automation techniques utilizing robotic process automation, machine learning, natural language processing and artificial intelligence. It is a suite of business-process improvements and next-generation tools that assists the knowledge worker by removing repetitive, replicable, and routine tasks. And it can radically improve customer journeys by simplifying interactions and speeding up processes. RPA is a software solution, commonly referred to as “bots”, which mimic or automate tasks normally performed by humans interacting with data between systems. In common definitions RPA essentially comes down to removing human beings from operations that are repetitive evaluations requiring rules based decision criteria. Whereas automation addresses high volume repetitive tasks, RPA is the next step to include decision making under a controlled set of parameters. Download the Chazey Partners RPA Booklet to learn more about Intelligent Automation and Robotic Process Automation. Like with other transformations, business leaders should adopt a structured framework with clear, tangible benefits and correctly defined expectations before embarking on an RPA journey. At Chazey Partners, our Robotic Process Automation solution offers you a clear, structured framework with which to launch and implement your RPA program. It ensures the technology is integrated well within existing systems and business operations and empowers your business to be future ready with dynamic adjustment of processes along your automation journey. 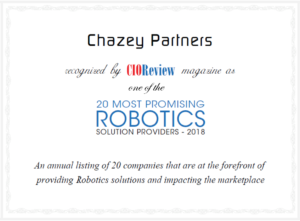 Chazey Partners was listed by CIOReview magazine as one of the 20 most promising Robotic solution providers of 2018. To request an RPA Demonstration, please contact us and we will gladly set one up. To help companies understand the RPA solution provider landscape, the CIOReview editorial board, along with a panel of prominent CEOs, CIOs, VCs and analysts, assessed several Robotics solution providers and produced a list of the 20 most promising providers in 2018. Chazey Partners’ significant, practical experience and its proven transformation methodology and approach to RPA implementation combined for a top 20 ranking.